Our Adult Program is designed on educating students in self control, self respect, and goal setting with perseverance and determination. We concentrate on helping students become self disciplined to achieve high goals for themselves while overcoming obstacles. We follow our SKF ™ twelve step system in order to offer exciting, vitalizing, and energetic classes that inspire our students to continue in the Martial Arts for years. 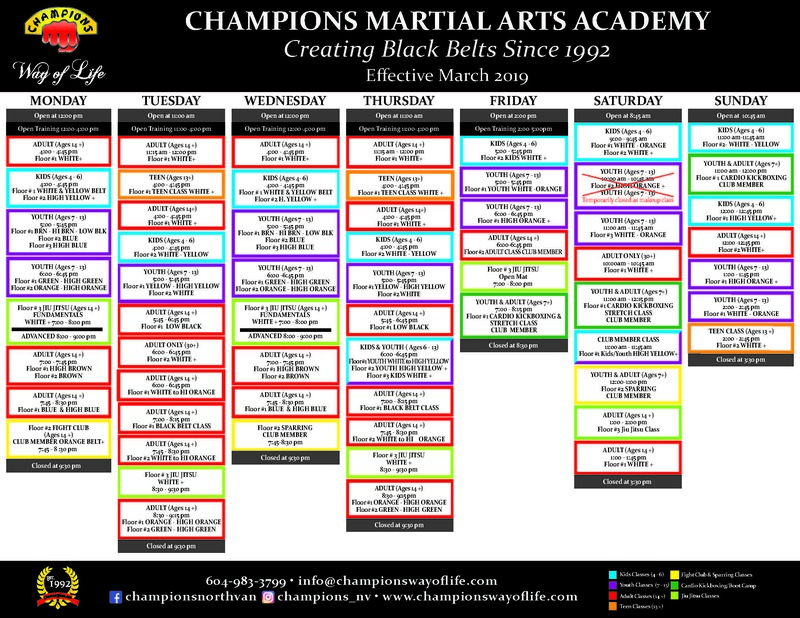 Champions has been the number one service provider of Kickboxing, Cardio Kickboxing, Boxing, Karate and Mixed Martial Arts for adults in North Vancouver, BC for over 20 years. We look forward to serving you in any way possible into the future. Our Adult Only program is a specifically designed program geared to the Adult who is looking for an rewarding experience in the Martial Arts, while increasing their fitness, flexibility and knowledge of self defense. The focus is to assist students in achieving their personal best by learning how to test their boundaries both physically and mentally. A great program with excellent fitness benefits, students achieve satisfaction from setting a high goal and accomplishing it one step at a time. At Champions we truly believe that it is never too late to start learning new things. The triple fat burning workout! SKF cardio-kickboxing will give you the results you''ve always wanted, while also learning to defend yourself in any situation. You''ll tighten, tone and firm your body while building a positive self image, increasing your self confidence and reducing your stress levels. SKF cardio-kickboxing is high energy, explosive, exciting and motivating; it is the greatest non-contact workout ever! Need more information on our Adults Program?